Okay, now for the food part of my weekend! If you go to Nuernberg you must try the Nuernberg Sausages from yesterday’s post! Very tasty! And small, too, so you don’t get too full! And beer. Ohmygoodness. I had lot’s of beer. Once I even had beer at 11:30 in the morning. But I didn’t feel bad becuase every other table to Germans had beer too. Welcome to Southern Germany. But it was hot, and I needed a refreshing cold wonderful beer to cool me down! This market was truly crazy. When we walked by, they were all yelling “Half price, half price! All fruit half price!” I have never seen people at a fruit market go that crazy!! Naturally, my dad and I bought some apricots and cherries because we couldn’t just walk by and not get anything!! Doesn’t this papaya look absolutely delisshhh? My dinner on Friday: Salad with olives, tuna, onions, rucola, tomatoes, cucumbers, and an egg. Full load! My dad had Carpaccio and a tomato and mozarella salad. The resteraunt was called Vapiano. It is an Italian restaurant chain in Germany (I actually think that there may be some in the US), but you wouldn’t know it’s a chain! They make all of the food right in front of you! Needless to say, after a hearty breakfast like that, no lunch was needed! I always forget how much I love scrambled ggs! Dinner Saturday: Italian, again. Germans love Italian food, so there are lots of really good and not so expensive Italian restaurants all over the place. My dad and I shared appetizers so that we could taste more than one! I rolled back to the hotel after this dinner. Yes, you counted right. We shared three appetizers. And then, all of a sudden they come out with a salad!! Apparently it came with the fish, but because the fish was a special that day it hadn’t said it anywhere! I couldn’t finish mine, but my Dad finished it for me, so no waisting food happening in our vicinity! And then the main dish: Fish! In German it is called a Dorade. I have no idea what it is in English… oops! I was very proud of myself for taking out all the bones so well! Look at all of the different types of pasta they had!! Crazy!!! And the menu was also cool because it explained where the dishes etc came from! Clever idea! Yes, I was FULL. No dessert necessary! And during dinner, what else did we do but watch the Germany-Uruguay game for third place! Germany one! Wooo! Trainer Jogi Loewe hugging his players! And one last pic of what a wonderful team they are! I swear, that was the last little bit of world cup news you are getting from me!! I am very very ashamed to admit, however, that I did have some sugar this weekend 😦 Before I remembered my goal, I ordered a Radler, which is beer mixed with sprite, and had orange juice (not freshly pressed) at breakfast. Fail. But at least I enjoyed it and food-wise I am still going strong! And now that I am back in Berlin, I know I will last for the rest of the time! But it was a very unfortunate moment when I realized what I had done. Also, today I bought my last jar of white almond butter. It was an embarrassing process because when I was checking out the woman at the cash register said “Oh, so you’re the girl who always buys the almond butter.” I had never seen her before in my life! Okay, I’m going to go live up my last week in Berlin!! Today I feel smart. Who knew that studying could do that to me! I’ve been studying all day (minus during lunch for two hours and since 6pm because I had to stand in line to get a good seat to watch the World Cup game) and it’s actually been, dare I say it, fun! But now I can actually go to museums in Germany with my Grandmother and myriad of other smart relatives that actually know their German history, and not wonder what the difference is between Friedrich Wilhelm, Friedrich Wilhelm I, Friedrich Wilhelm II, Friedrich Wilhelm III, Friedrich Wilhelm IV, Friedrich der Grosse, Friedrich III/I, Wilhelm II… and the list goes on. I don’t get why they all have to be named the same way. So uncreative! Breakfast was a leftover mango from yesterday with strawberries. So delicious. Don’t hate me overnight oat-lovers, but I think this may have beat my morning bowl of oats. It was that good. And I finished it off with a few spoonfuls of almond butter. Then I had an iced coffee and got studying. And I was so diligent that I studied right through lunch! So I had leftovers from last night for lunch/dinner, and it was actually better than last night because the mango flavor had become stronger overnight! And for dessert and Allos bar before heading out to see the game. Unfortunately we couldn’t pull off another 4 goals. 😦 So Spain is going to the finals, and for the second time in a row, we have to play for 3rd place. And it was especially sad since we lost against Spain two years ago in the finals of the Europe Cup. But it is only fair to say that today Spain played better. And we are still one of the four best teams in the world! Next World Cup, here we come 🙂 But you will be very proud of me, because I didn’t drink beer (which is such a must during world cup season)! German beer actually has no added sugar, so I wouldn’t have broken my no-sugar-rule, but it can’t hurt not to drink it, right?! my friends’ beer! Just looking at that makes me thirsty! But enough pity partying! Wish me luck on my exam! See you when I am on the other side in Freedom!! Did anyone else just start singing the GLEE mash-up song when they read that title? If you did, I am very proud. I promise, more of my Gleekiness coming up soon. First of all: Happy Fourth of July! Oh goodness, so the past few days have been off of the record a little bit, food wise and other pictures wise because I’ve been so busy! Exams, World Cup Extravaganza, Dating!. It’s all been mushed into these last days, but, before I go into detail, I have to confess something to you guys. I have never, not once, been in the US for the Fourth of July. Is that a crime or what? Oh wait, I just remembered I was there last summer, but I got my wisdom teeth out the day before so I was out of it and didn’t really know what day it was. But it’s okay, because I spent the day with some of my American friends and we had a grill party! And sang the National Anthem. It sounded pretty fantastic. But I can tell you, that after a breakfast of iced coffee and an Allos bar, my chicken burger (I forgot to take a pic!) was delicious!! I hardly ever eat beef, so the chicken was topped with lots of tomatoes, cheese, lettuce, and ketchup. So. Good. And for sides we had a variety of salads, from potato, to pasta, to lettuce-y salads. And watermelon, courtesy of moi! I have a fun picture I want to post, but I have to wait until my friend sends it to me! Then you will see all of our American Pride! Another confession? Once again, for about the fourth (+) time in a month, my voice is hoarse. (Consider yourselfs lucky that you didn’t have to listen to me singing the National Anthem… it wasn’t pretty.) It’s all this World Cup Madness!!! But really, can you blame me!? Another 4:0 win for Germany!!! What is up with these four goals in almost every game? Whatever it is, I LOVE it! And I’ll tie my next confession in right here: soccer player’s have the BEST bodies. It’s true. Wonderful. I don’t understand why soccer isn’t a more appreciated sport in the US, even though I confess that when I am there I hardly watch it either. But it is so fun! Where I watched the game! Another confession. My eats lately have been less than blog worthy. I need to get back on my game. For example, although I was full tonight after that burger, I went on a short walk to the German Parliment, Reichstag, and Brandenburger Tor with some friends and we decided to stop at an italian place. The pizza looked so good that I HAD to order some. While most of it is now in my fridge, I couldn’t resist a bite of this baby, fresh-out-of-the-oven. Pesto and Spinach topped with a heap of fresh tomatoes. Tomorrow when I re-heat I will add some of my basil! Next confession: I miss air conditioning! I thought I was a tough cookie when it comes to that, but I’ve succumbed to sitting around in minimal amounts of clothing attempting to “study” and wishing I could just sit in a cold bath all day long. My last confession. I like a German boy. Maybe my dream of finding a fellow German has finally come true. Minus the fact that I leave Berlin in less than two weeks, but let’s not think about that. Let’s think of the fact that maybe, just maybe, he may like me too! He payed for my drinks last night, so that’s a good sign, right?! Do I sound like a middle schooler right now? Probably. But it makes me smile! Oddly enough, when we first met, I didn’t like him at all, but we’ve been hanging out, and maybe it helped that we were so happy that Germany won last night and after a few drinks everything seems better, but it was just so fun! Now, since I’ve spilled my heart out to the blog world, what are your confessions!? I hope everyone had/is having a wonderful Fourth of July! To greet you in a typical Bavarian way: Servus and Grüß Gott! I hope everyone had as great a weekend as I did! I went to see a friend in Munich that I hadn’t seen since my boarding school years four years ago! And what’s even better than a reunion is a reunion that feels like no time has gone by! Don’t you love friendships like that?! I have a whole food collage coming for you guys, because guess what I did? A culinary city-tour of Munich. Yes, it’s true! It was amazing!! But I want to share my culinary tracks with you from the start to the end of my trip! I had a very Bavarian meal: Rahmschwammerl mit Semmelknödel. I wish I could translate, but translating from the Bavarian accent to normal German to English is just kind of impossible… But I can tell you one thing: Delicious. See my beer mug in the back?! I even got to keep it! Unfortunately there was a thunderstorm right after we finished, so, drenched from head to foot from the walk back down to the Freibier Fest, we got another beer and headed home. Munich Townhall. One of my favorite buildings ever. If I had any idea what is was, I would love to share, but whatever it was, all I can say is fan-tas-tic. Lots of yummy South American / Latin-American goods to buy! This stop was followed by Käs-Müller, a cheese and wine shop. Again, love the inside! First taster: Obatzter. A very typical Bavarian beer garden cheese that is mixed with peppers, butter, cheese, and onions and eaten with a “Brezen” or a type of soft pretzel. Not the biggest fan because it is very heavy, but the small portion we got was just right. In the fabulous weather that we had, the next stop was perfect: Il Gelato italiano. For a second I felt like I was in Italy, with this home made Stracciatella-Rasberry flavor. I’m usually not a fan of the fruit mixed with the creamy, but this was another hit. And finally (I was SO full by this point) the last, and arguably the best stop, Café Wölfl. I had to take two pictures, because all of the cakes looked so good. I got to taste the Apricot Streusel. Superb. And we got to meet Mr. Woelfl! I recommend every single one of these places, so if you are ever in Munich, GO! We followed the mass-eating tour with a fairly long walk through Munich, with a stop at a black and white photography gallery. I took a black and white photography course last summer, so it was really interesting to see. And then we stopped by the park, where there is a wave in the river where people surf! In the middle of Munich! Saturday night we went to see Hamlet at the Volkstheater. I was excited because it’s my favorite Shakespeare, but the production was ‘comme si comme ça’, so-so. Too modern for a Shakespeare in my opinion. This morning we walked around Julia’s university in Freising, near Munich. Look at this adorable town. How enchanting! And these flowers! It was like I was in Candy Land! After a sad goodbye, and the hope that not another four years will pass before we see each other again, I arrived in Berlin. Just in time for, what else but the Germany vs England game! CONGRATS to Allemania!! People are still going crazy outside! What a game!! Finally the boys played well again! I thought this image was great. The ruined church from WWII with German flags in celebration in front! How things have changed! Off to celebrate a German Victory!! After my post yesterday, I was pondering my favorite children’s books, and I realized I should have been more thoughtful with my choices. I left out The Lady with the Alligator Purse and the Amelia Bedelia Books and all of the Nancy Drew mystery books! As you can tell, you can NEVER asked me to choose my favorite books (see my Book Club page —def some overflow beyond the Top 10…). They are all my favorites! So, on with life. Yesterday after a breakfast of overnight oats, some fruit, and a delicious iced coffee, I prepared myself for a day full of football. (Notice the use of the European term ‘football’! I need to go back to America!) USA vs. Algeria. Germany vs. Ghana. Here is a wonderful picture of my German spirit. I know what you are thinking: “Can she stop talking about the World Cup?” Only 2 more weeks I promise! You should all watch and be excited with me! Check out those suspenders! Courtesy of my friend Dorothy! I visited my godmother in her studio. She has The Coolest Job EVER. She does painting restoration. Is there a term for that? Restorator? Oh-uh, my computer just underlined that in red. I guess it’s not a word… Anywho, she has restored paintings as fantastic as Antoine Watteau‘s work! She had to transport one of his most famous images from Berlin to NYC, where she was escorted by security because the painting was so valuable! Almost like the life of a celebrity! Her studio is fabulous. This is just the courtyard, but (even though the lighting isn’t stellar) isn’t it pretty? It was made for a community of artists in 1889 so they could all work in an inspiring environment. I forgot to take a picture of the inside, but I will try to do it next time I go because I want to share its wonderfulness with you! Today she was working on a painting that was done by a friend of Paul Klee‘s. It’s times like this where I wish I could draw. Or have a cool job like that. Or know what I want to do with my life at all. Does anyone else have these issues? For lunch I had the remains of my chicken curry, which unfortunately was not that much. But as it turns out, that was good, because my afternoon turned out to be fairly unhealthy and calorie filled! But hey, it happens, right? I headed to a beer garden near my university to watch the US-Algeria game with one of my American friends! (How cool is it that the universities here not only serve alcohol in their cafeterias, but basically have a beer garden on campus!?) We scored the winning goal in overtime, courtesy of Landon Donovan! This means we move on and even ended this round better than England! Here I quenched my thirst with two small Radler, the most amazing German invention. Beer and sprite. It sounds strange you say? Trust me. A-ma-zing. After a quick ‘costume’ change, I joined German friends at a Mexican restaurant for the next game! A fajita later I was ready to watch Germany pull off a big win! It was a lot, so I could only eat about half, which was probably a good thing because my tummy is never happy when I eat too many onions. My favorite part were the tomatoes! Don’t they look yummy? Unfortunately I had to wait quite a while for just one goal to be scored in the game, the winning goal I may add, but my boys just didn’t pull it off the way they should have. Good thing I had a Mango Colada to tie me over. 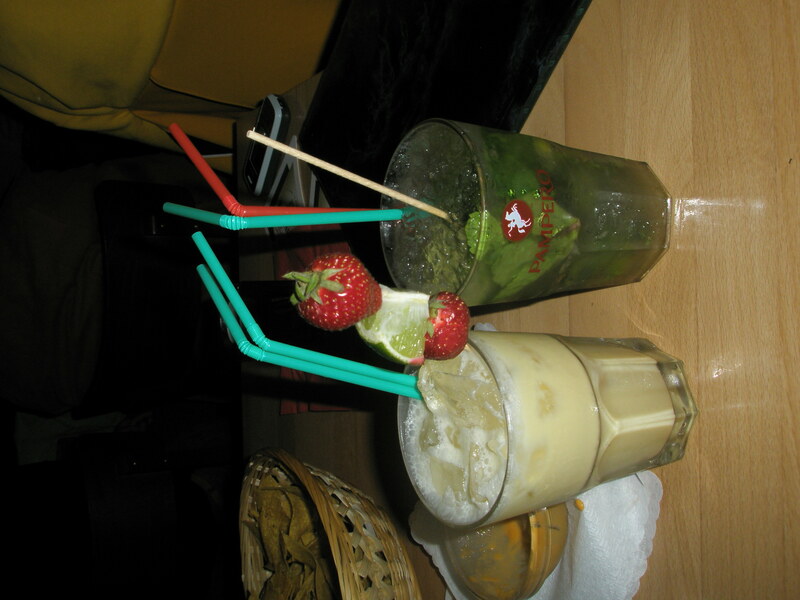 No worries, the other drink is my friend’s mojito! Do you know what I really miss about the US though? Crushed ice! Because all though this was quite tasty, any kind of colada is better with crushed ice, not ice cubes! Now big rivalry against England on Sunday. This will be tough. But I think we can all agree that I had a pretty successful night. I apologize in advance for all of my football talk, but I have to let out my passion somewhere! And it’s only every four years for four weeks! I promise! As a treat for listening to my rants I had some really fun videos of drunk Germans singing in the subway and cars honking after the win, but I can’t upload them 😦 If I figure out how, I will def share them with you! Lot’s of love from across the pond! PS Thank you so much to my good friend Megan who gave my blog a shout out on hers! She officially has me hooked on overnight oats and almond butter!